One of the most enjoyable and hilarious trends of the holiday season is the ugly Christmas sweater party. If you haven't had the honor of attending one of these fun-filled gatherings, then you are in for a treat. Since you will (presumably) only be wearing your ugly sweater once or twice a year, there is no need to go broke trying to find the most hilarious sweater possible. 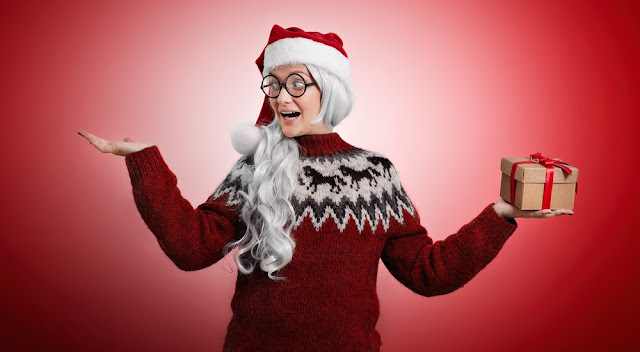 Thrift stores are an excellent source of pre-loved festive sweaters, or you can create your own with a plain sweatshirt and some simple craft supplies. For some tacky and wacky inspiration, here are 16 DIY Ugly Christmas Sweater ideas for you to try this holiday season. 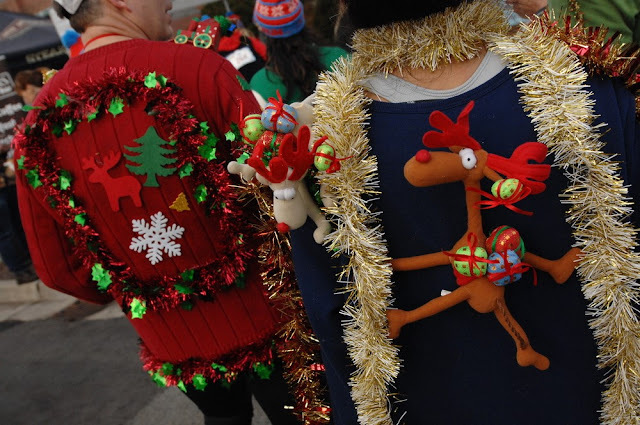 Christmas motifs taken to new levels of kitsch is the name of the game when it comes to creating the perfect ugly Christmas sweater, and one of the more iconic images of the season is Santa's reindeer. This cutesy sweater only needs some sparkly metallic paint and your hands to create a reindeer fit to lead Santa's sleigh. And with some strategically placed bows, you can create a set of "his" and "hers" ugly sweaters for a cute couples' costume. 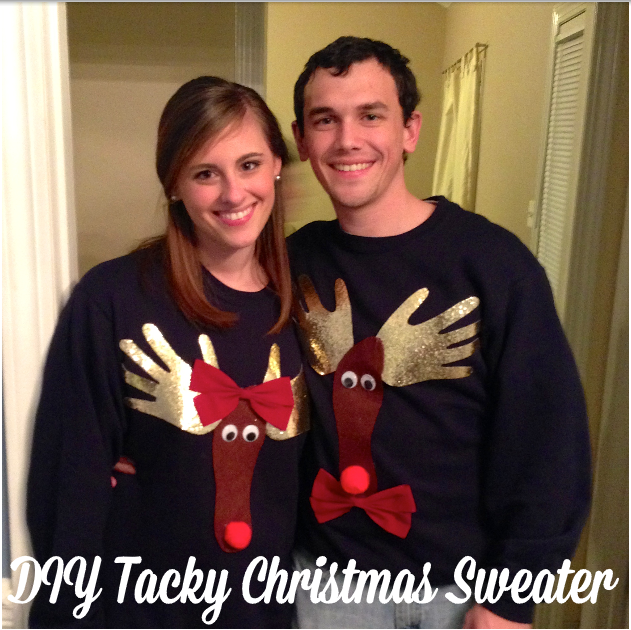 For another couple's reindeer costume, try this fun sweater combination. The best ugly sweaters are wacky, tacky and tasteless, and this sweater checks all three boxes. One of you will have the front half of the reindeer, and your partner-in-hilarity will have the back half, and the rest of the sweater is covered in assorted Christmas paraphernalia. The vast number of parties at Christmas means there are plenty of recyclable supplies leftover to create some fantastic festive crafts. With just a hot glue gun and leftover bottle caps, you can create an enviable (and eco-friendly) ugly sweater in minutes, making it the ideal last-minute option for your office Christmas party. You can try collecting caps of similar colors for a cohesive look or go for a random selection for a truly ugly creation. Is there anything cozier or more festive than a beautifully decorated fireplace mantle? Channel your inner interior decorator and break out the Christmas stockings, tinsel and baubles to create your cozy mantle sweater. This creative ugly sweater uses Christmas decorations you probably already have on hand, as well as some fabric paint to create a great 3D design. You may need to spend most of the party with your arms spread out, but it is a small price to pay for one of the best ugly sweaters of the night. Add some sparkle to your sweater by incorporating Christmas lights into the design. Putting lights on your ugly Christmas tree sweater is less complicated than you think, but you may need to carry a spare pack of batteries with you. If lights are a little too flashy for your taste, try adding some glitter for a sparkly tacky sweater. Snowmen are one of the most recognizable Christmas motifs, and this sparkly, glitter-dusted snowman is sure to get you noticed. For those who prefer a subtler approach to holiday costume parties, this Christmas light ugly sweater is so cute you will want to wear it again and again. You will need to be handy with a crochet hook, but the tutorial is straightforward and has plenty of photographs to follow. He's a mean one, Mr. Grinch! And he also makes an ugly sweater. Get inspired by one of the wackiest Christmas characters of all time with this grinchy sweater. Get started early, and you could even try it out as a cool Halloween costume. With this sweater, you are guaranteed to be the most popular person at the party, and you won’t go hungry if you miss out on the canapes. All you need is a bag of mini candy canes, a glue gun and a plain sweatshirt, and you have a tacky-but-delicious sweater. Another spin on the candy-filled sweater is this advent calendar sweater idea that is full of sweet surprises. Count down the days to Christmas with a sweater that is covered in felt pockets full of candy. If the idea of sticky Christmas candy doesn't appeal to you, try filling the pockets with toys or cringe-worthy Christmas jokes, and you will be the life of the party. This fantastic sweater is a real performance piece, so you may find your arms are a little tired by the end of the party. By wrapping and securing tinsel to the sweater, then attaching a few select ornaments, you can create the shape of a Christmas tree with a mini hula hoop and by holding your arms above your head. Just add a tree topper, and you have a winning costume. Pull out all the stops and add some dimension to your sweater. Stuffed toys, pom poms and fringe all combine to create one of the craziest looks of the season. You can use this method to create any Christmas sweater, but one of the best 3D sweaters is jolly ol' Santa. With his fluffy white beard and round belly, he is perfect for creating a 3D masterpiece. What's tackier than an ugly Christmas sweater? Ugly Christmas ties! Combine the two for an ugly sweater that surpasses the rest. Add a huge bow and some button ornaments, and you will have the ugly sweater contest in the bag. Thrift stores are a great resource for finding all sorts of wacky patterned ties, or you could raid your Dad's closet. Want the most unique sweater at the party? Try this unusual snow-globe-inspired outfit that takes a humble salad bowl and turns your sweater into a sparkling explosion of Christmas cheer. You can add whatever Christmas toys you like, but be aware you will probably be asked to jump around all night so people can see the globe at work. Crafting an elaborate ugly sweater can be time-consuming and expensive, so for a fast budget-friendly option, try this stocking sweater. All you need to do is attach a Christmas stocking to a plain sweater, and voila, you have a great sweater, and as a bonus, the perfect place to hide your Christmas snacks. Finally, if you are really pushed for time or have a limited budget, just safety pin whatever Christmas baubles you can find all over a plain sweatshirt for a look that says: "A Christmas supply store threw up on me!"